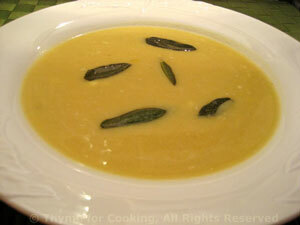 Savory Acorn Squash Soup, Thyme for Cooking gourmet first course. Apple adds a bit of sweetness to this soup; the ginger a bit of spice. Crisp sage leaves are used for garnish; if you don't have any, top with a dollop of yogurt and a sprinkle of nutmeg. Cut squash in half and remove seeds. Place cut side down on a dish and microwave until tender. Remove and let rest until cool enough to handle. In medium saucepan sauté onion in butter until tender. When squash is done remove from shell. Add squash, apple, stock, ginger and nutmeg to onions. Heat to boiling, reduce heat, cover and simmer 15 - 20 minutes.